The process to remove all decimals in Excel worksheets is easy and only requires a formula to accomplish. 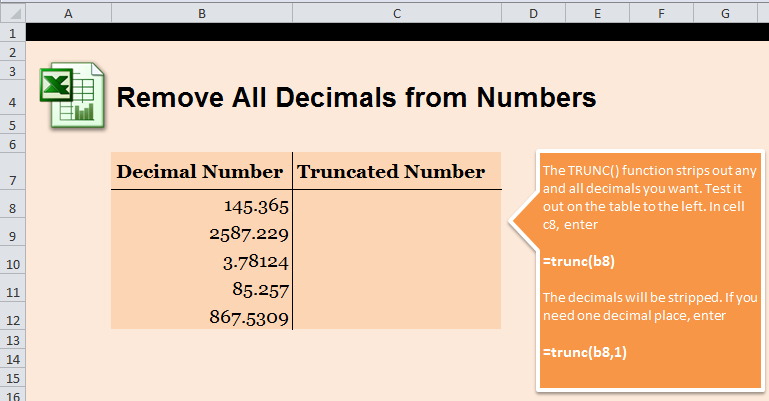 The process of changing decimals numbers to truncated numbers is helpful when you are tired of doing math with large numbers. Download our example spreadsheet to follow along and learn how to accomplish this feat. C8 should now have “145” entered. If you want to truncate the rest of the numbers, simply drag cell C8 down to C12 and the formula will adjust and change each decimal number into a whole number. There is also another use for the truncate formula that you can use if you want the decimal to remain, but to shorten the length of it. B8 will now read “145.3”. Chance the “1” in the formula to allow more decimals if you want. Learn more about Excel wizardry with our Excel tutorials.